Japan has announced for the first time that a worker at the stricken Fukushima nuclear power plant died after suffering radiation exposure. The man, who was in his 50s, died from lung cancer that was diagnosed in 2016. Japan’s government had previously agreed that radiation caused illness in four workers but this is the first acknowledged death. The Fukushima reactor suffered meltdowns after a 9.0 magnitude earthquake and a tsunami in March 2011. 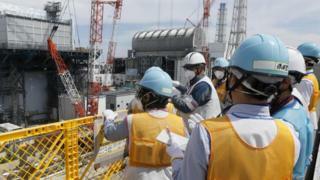 Cooling systems were wrecked at the plant on Japan’s north-east coast and radioactive material leaked out. The employee who died had worked at atomic power stations since 1980 and was in charge of measuring radiation at the Fukushima No 1 plant shortly after its meltdown. He worked there at least twice after it was damaged, and had worn a face mask and protective suit, Japan’s Ministry of Health, Labour and Welfare said. After hearing opinions from a panel of radiologists and other experts, the ministry ruled that the man’s family should be paid compensation. The Fukushima meltdown was the world’s worst nuclear accident since Chernobyl in 1986. Around 18,500 people died or disappeared in the quake and tsunami, and more than 160,000 were forced from their homes. Though no-one died directly in the nuclear meltdown, plant operator Tokyo Electric Power Company (Tepco) is facing several compensation claims. In June last year, three former Tepco executives went on trial charged with professional negligence linked to the hospital evacuation.